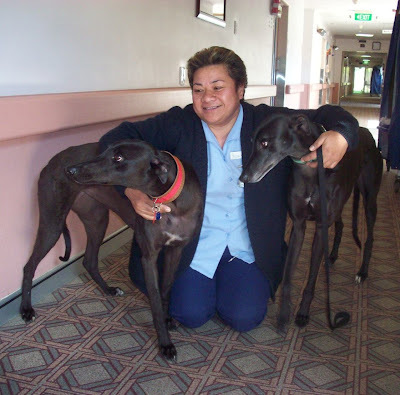 Today, Louie and me went and visited ex-racer Gemma at the Elizabeth Knox rest home and hospital in Auckland (in Epsom). This rest home is adopting the 'Eden Alternative' in rest home care which was developed in the USA and it is a very different way of rest home care. 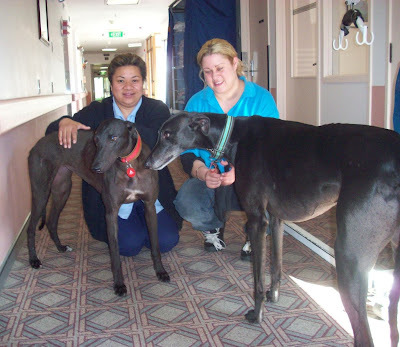 In the States they identified the greyhound as the most suitable dog to live in these homes, as they don't bark, sleep a lot, and are the perfect height :-) The home is looking at a ratio of 1-30 dogs to residents. Gemma is the first dog to join them, and hopefully they will be looking for another couple of dogs soon as Gemma has fitted in so well! Gemma has been there for 3 weeks now and she has certainly fitted in well! She has a lovely bed in one of the resident's rooms, and she is free to roam the home and the gardens freely. She lives with two resident cats and is great with them. Regan Sharp specially trained Gemma to live in rest home environment, and Gemma has taken to it like a duck to water! Regan did an amazing job - Gemma has had no toilet accidents since she arrived, is completely cat-safe, is very friendly and gentle with residents and has settled in nicely. She has also learned to steal food from trolleys, which the staff find absolutely adorable!!! Residents and staff simply adore her, as you can see from the pictures. 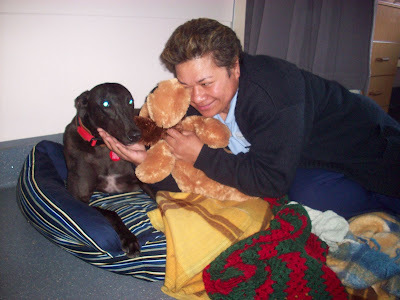 :-) Louie loved her too :-) A couple of residents came over and asked whether Louie was their new greyhound!